December 18, 2014: Shell Iraq Petroleum Development (SIPD) has signed a Memorandum of Understanding (MoU) with AMAR to formalise their partnership in Iraq. SIPD has been working with AMAR, founded by Baroness Nicholson of Winterbourne, in the communities surrounding its operations at the Majnoon oilfield, 60 kilometres from Basra in southern Iraq, since 2010 through extensive health, educational and road safety and training projects. The partners currently deliver more than 1,000 services each month through mobile health clinics that take doctors, nurses, pharmacists and technicians to some of the poorest and least-accessible areas of Basra to administer medical supplies. Around 2,500 children attend health education sessions in schools, and more than 4,000 benefit from road safety education – a pivotal programme as road safety accidents are one of the leading causes of fatalities in Iraq. In addition a further 4,000 Iraqis benefit from Women Health Volunteer visits as experts train local women on basic essential advice on family and health well-being. AMAR recently launched an emergency appeal, supported by SIPD, to help fund its work with the Internally Displaced People (IDPs) that have fled from their homes as a result of the recent security developments. Commenting on the future of the partnership Baroness Nicholson said: “We hope to build on the incredible success of our partnership with Shell for many years to come. Shell’s management and staff have been supportive towards our work as they share our vision that our teams on the ground can make a difference. “AMAR has a strong business model, where much of the administration and support comes from just 12 people in London, for a 1500-strong team of Iraqi professionals and volunteers. 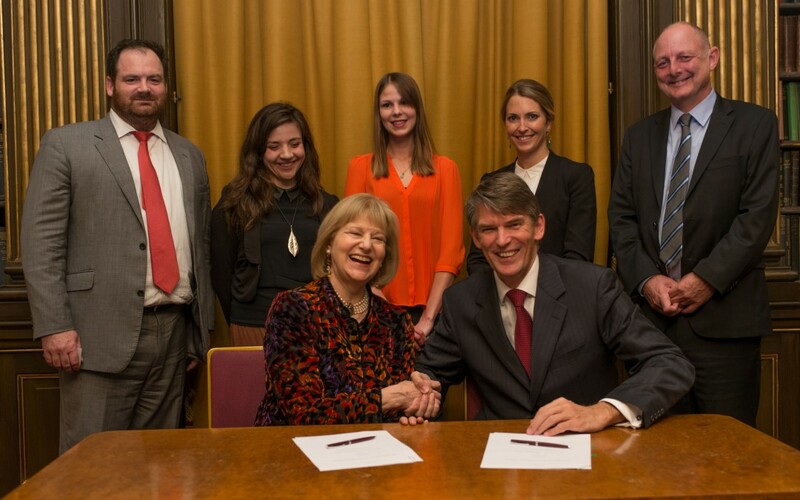 The Memorandum of Understanding was formally signed by Baroness Nicholson and Hans Nijkamp at London’s Reform Club on Wednesday, December 17th, 2014.